Laser Hair Removal Negligence Burns Claims Guide – How To Clam Compensation For Laser Burn Negligence? From slips and trips, to road traffic accidents, to workplace incidents… We are all aware of the most common types of personal injury claims. However, there are other incidents that are less common, yet just as important. One of these is beauty treatments that have gone wrong. In this guide, we will take a look at laser treatment in particular. Laser treatments are increasing in popularity. There are lots of different types of laser treatments, from those designed to improve vision, to laser treatments to clear up acne or scars, to hair removal. Generally, these treatments go well, yet there are unfortunate instances whereby mistakes are made. If you have been the victim of a laser treatment that has gone wrong it is likely you will be entitled to compensation. In this guide, we are going to deal with claims for laser hair removal negligence specifically. Here at Advice.co.uk, we can help you to get connected with the solicitor to get the compensation you deserve. We have years of experience when it comes to laser hair removal burn claims. Before you call 0161 696 9685 though, read on to discover everything you need to know about making this type of accident claim. What’s Laser Hair Removal Treatment? What Is Laser Hair Removal Burn Negligence? How Much Can I Claim For Laser Hair Removal Burn And Negligence? What Duty Of Care Am I Owed By A Clinician Or Beautician? This is a treatment that is extremely popular in the United Kingdom at present. It is imperative to be aware of the fact that laser treatment is actually used as a part of several different treatments. From removing hair to reducing the appearance of acne, it has many purposes. In this guide specifically, we are concentrating on laser treatments for hair removal. However, you can claim for any type of laser treatment that has gone wrong. Most people have laser treatment and are over the moon! They feel like a completely different person. However, for a very small number of people, this is not the case. If you have fallen victim to someone who has not carried out laser treatment properly, you will be entitled to claim. There are several issues that can happen because the procedure was not carried out right. For instance, the person could have exposed you to too much laser, or they may have failed to inform you about the risks beforehand. In this guide, we will answer all of the questions you have about this type of case. This includes the following: Can you get burned from laser hair removal? Can I sue for laser hair removal? Is laser hair removal bad? How much laser hair removal burn compensation will I receive? If you still have any queries by the time you get to the end of this guide, please do not hesitate to give us a call. Laser hair removal treatment involves removing unwanted hair from a patient’s body by using pulses of laser light to destroy the hair follicle. This treatment has been available commercially in the UK for over 20 years now, and has become one of the more common hair removal treatments over here. There are a number of reasons why this is the case, including the fact that this is one of the more long-term hair removal solutions. Not only this, but laser hair removal treatment can be carried out quickly and problematic areas are targeted, meaning the surrounding areas will not be impacted. Laser hair removal negligence refers to any instances whereby laser hair removal has not been carried out properly. There are a few issues that can arise if the professional has not carried out the laser treatment correctly. One of the major issues is when the individual has been exposed to too much laser. This can result in scarring and burns. It can also cause a change in pigmentation and skin texture. Failure to provide protective equipment or follow the correct procedure can cause injuries. The therapist also needs to discover the details of the individual’s medical history. They will have to test the customer’s skin sensitivity as well. Failure to act thoroughly before the procedure can also cause issues. If your therapist has acted in a way they shouldn’t or failed to do certain steps they should have, and this has caused an injury, this is laser hair removal burn negligence. You probably want to know how much laser hair removal burn compensation you will receive if you make a claim. There are a lot of personal injury claims calculator tools online, which promise to tell you exactly how much you will receive if you make a claim. We do not recommend using these tools because it is impossible to tell you exactly how much you will receive if you make a claim, as all cases are assessed on an individual basis. Instead, the best thing to do is look at the amounts people have received when making claims for injuries similar to yours. We have put this information together in the table below. If you cannot find the injury that you have sustained, please do not hesitate to give us a call for more information. It is imperative to note that compensation is split into two sections. To begin with, you have general damages, which relates to the compensation you will get as a result of your suffering and the extent of your injury. Nonetheless, you will also receive special damages. Special damages are any out of pocket costs you have incurred because of the injury. This can be anything from childcare fees and travel expenses, to medical costs and loss of income. You can definitely make a claim for compensation if you have had blisters on your skin afterward. This can happen if the person carrying out the treatment has penetrated the skin too deeply. This would typically occur if the person was untrained. If this has occurred, you definitely have the basis for a payout. Give us a call today for more information. Can laser hair removal burn your skin? Similarly to blisters, you could experience a burn if the person carrying out the treatment has left the laser on the skin for too long and penetrated it. This would happen if the individual simply was not taking the correct level of care when carrying out the treatment, or if they had not received the right level of training. Either way, you will be able to claim for compensation if this has happened to you. Laser hair removal is popular on the arms and armpit area. If you have experienced any sort of negligence during this treatment, you will be able to make a claim. There are many ways that laser hair removal can go wrong if it has not been carried out properly. This includes issues with skin pigmentation, causing an uneven skin tone, as well as blisters and burns. No matter what has happened, whether you have experienced laser hair removal burns on your arms or any other injury, we will help you to get the compensation you deserve. Just like the arms, the legs have become a popular part of the body for laser hair removal. A lot of people prefer this because it is a lot more convenient. The impact of laser treatment can last for up to seven months, whereas shaving your legs may only last for a day or two. However, the benefits of laser hair removal treatment will be erased if the treatment has not been carried out properly. If this has occurred, and your skin has been scarred, burned, or you have experienced any other symptoms, call Advice.co.uk today to make a claim. If you have been left with a scar, or any other type of irreversible damage on your skin, because of laser hair removal treatment, you can definitely claim. Call us today for more details. Aside from the other injuries that have been mentioned, laser hair removal can cause uneven skin tone to arise if carried out incorrectly. This can then lead to psychological injuries for the person who has experienced this. We can help you to claim for the physical and mental injuries associated with this type of injury. When you go for laser hair removal treatment, your beautician or clinician should explain the treatment and they should go over any of the risks that are associated with it. This is a legal requirement under their ‘duty of care’ to you. They must also carry out the procedure in the correct manner, ensuring that you are not harmed during the process. There are a number of rules and regulations in place governing the beauty and cosmetic sector, and if the salon has breached these regulations, you can make a claim. It is important to recognise that there are time limits in place for all personal injury claims. Please refer to the table below for more information. See A Medical Professional – First thing is first, make sure you go and see a doctor after you have suffered this type of injury. This is one of the biggest mistakes people make. After all, a laser burn can sometimes be a minor injury, and therefore people feel they can look after themselves rather than enduring a trip to the doctor. However, if you do not see a medical professional there will be no proof that you have even suffered a laser hair removal injury in the first place, and so you will not be able to claim. Get Contact Details Of Witnesses – Of course, it is important to try and get the contact details of the person that caused the accident. Usually, this should not be too difficult. However, the perpetrator’s details are not all that you need. If you can get any contact details from people that witnessed the accident, then do! Their statements can prove to be a very valuable tool when it comes to getting you the full amount of compensation you deserve. Perhaps someone accompanied you to your appointment? Keep Proof Of Expenses – Last but not least, it is vital to make sure you keep proof of any expenses that you encounter because of the accident. Have you had to arrange additional childcare for your children? Have you had to pay for various medicines? Have you suffered a loss of income because of an inability to work? Whatever the reason may be, you will be able to claim for these as special damages when it comes to your laser burn settlement, and so receipts are pivotal. To determine whether you have the good basis for a claim you simply need to ensure the incident occurred within the personal injury claims time limit, that it was not your fault, and that you received medical attention for your laser removal burns. If you can do so, the next thing you ought to do is get in touch with a quality No Win, No Fee personal injury lawyer. Going down the No Win, No Fee route is highly recommended for a variety of reasons. If you go for this kind of solicitor you are going to benefit from a better level of service, as the solicitor is going to be more impacted by the outcome of your case and they will not take it on if they do not believe you have a good chance of getting compensation. 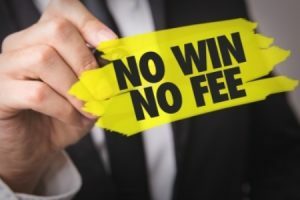 Aside from this, one of the main motives for choosing a No Win, No Fee solicitor is the fact that you will not need any money to begin your claim. Moreover, you eliminate the financial risk that is associated with going for a traditional solicitor. This is something a lot of individuals worry about. After all, the financial implications are potentially damaging if you lose your case and do not go for a No Win, No Fee service. On a final note, you will be pleased to know that all the solicitors who we connect you with at Advice.co.uk work on a No Win, No Fee basis. Therefore, if you have suffered a laser hair removal burn injury, you ought to call our free helpline to discover more and be matched to a specialist solicitor who will handle everything for you. If you have suffered because of a laser treatment that has gone wrong all you need to do is get in touch with Advice.co.uk to make a claim. We are one of the leading companies of our kind in the country. We have an extensive amount of experience in personal injury claims, having been set up many years ago and successfully helping thousands of personal injury victims since. When you call our helpline you will speak to one of our advisers and they will put you in touch with a great specialist solicitor to handle your laser hair claim. All of these solicitors work on a No Win, No Fee basis. This means that you do not need any money to begin your claim and financial risk is diminished dramatically. So, what are you waiting for? Give us a call today. The process we follow is really straightforward, as you will see from the table below. If you are ready to make a claim for the laser burn negligence you have experienced, all you need to do is give Advice.co.uk a call today on 0161 696 9685. You can reach us any day of the week, from 9 am until 9 pm, so please call at any time that is convenient for you. There are other ways to get in touch with us too, for instance, you can leave your contact details and we will call you back at the earliest opportunity. What the NHS says about laser hair removal – This page from the NHS might be of interest. Scarring NHS – Another page from the NHS – this time about scarring.